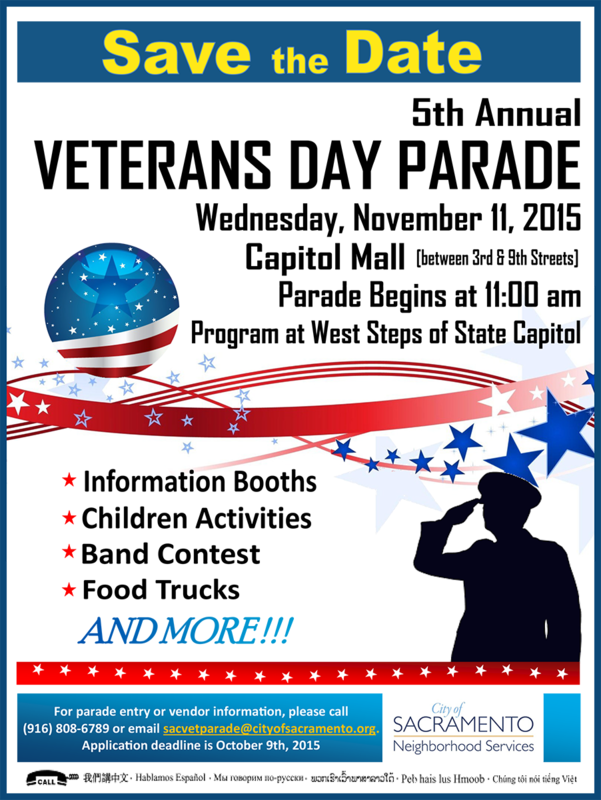 A parade to honor veterans will be held today at 11 am (starts at Capitol Mall & 3rd and ends at 9th Street) followed by a program on the West Steps of the Capitol. Find details here. Members of the public are invited to honor their deceased friends and family members who served in the U.S. military in the Veterans’ Community Altar at the California Museum. Open until 5pm. All military personnel, veterans, and their families will receive a 50% discount on admission to the Sacramento Zoo (with a valid military identification) and free admission to the Sacramento Children’s Museum. California is home to five Fisher Houses, which allow families to live (for free) at a “comfort home” near the hospital their soldier is recuperating in (think Ronald McDonald house, but for the military). Over 90% of your donation goes directly to helping those who need it most rather than towards administrative or fundraising costs. Operation Homefront is another great organization that helps (over 257,000 so far) military families with everything from financial and food assistance to support groups for spouses of wounded soldiers. Have furniture or a car donation? Willing to help a local vet find a job? Just click on the Current Needs page and sign up for whatever need fits your situation. Want the whole office or book club to get involved? Consider adopting an entire platoon on active duty. Founded in 1998, Adopt-a-Platoon supports all branches of the military and strives “to lift the morale and provide a better deployment quality of life.” You can send care packages or adopt or pen pal a single soldier, small platoon (up to 35) or large platoon (over 35). For the larger platoons, you send care packages to one point of contact making the process easy. Love animals and vets? Check out the SPCA’s Operation Baghdad Pups. From the website: U.S. troops in Iraq and Afghanistan befriend local animals as a way to help cope with the emotional hardships they endure every day while deployed in a war zone. The Operation Baghdad Pups program provides veterinary care and coordinates complicated logistics and transportation requirements in order to reunite these beloved pets with their service men and women back in the U.S. These important animals not only help our heroes in the war zone, but they also help them readjust to life back home after combat. Netflix subscriber? Watch “Operation Homefront: Writing the Wartime Experience” – one of the most honest and raw documentaries out there. A project of the National Endowment for the Arts (NEA), writing workshops and classes are provided to encourage soldiers and their families to write down and share their personal wartime experiences. Part-therapy, part-self expression, they fervently believe that everyone in the military has a powerful story worth sharing. The documentary illustrates several stories (narrated by various actors like Beau Bridges, Robert Duvall, Aaron Eckhart and John Krasinski) and includes interviews with the authors, as well as other well-known/best-selling authors who have served in the military. The book version includes nearly 100 uncensored eyewitness accounts, private journals, poems and other writings.